Fashion: The Annual Nightmare Before Christmas. Winter Coat Shopping. Where to get the best winter coats from? A question which haunts me annually before Christmas. The thing is, my warm winter coats barely last for one season, mainly because the quality of the fabrics isn't as good as it was twenty years ago. The usual wool-blends to be found on the British High Street aren't resistant to the persistent rain and humidity in the UK, hence why ugly bobbling and peeling are on the cards and have wrecked one coat after another over the years. Currently, the retailers are fully stocked with winter coats for women and it took me a good while to find a decent one this year. It feels like you can't rely on a specific retailer anymore, for example, if I need to buy a new blouse for work I know exactly Uniqlo is the right place to go. 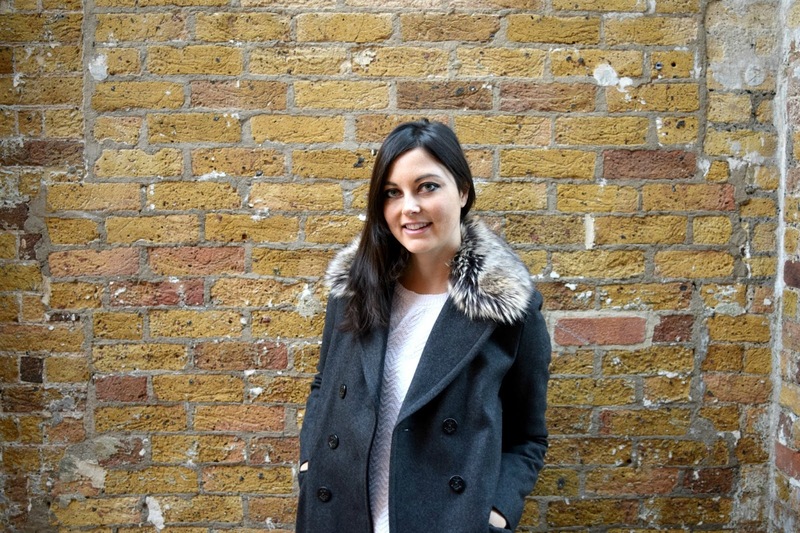 For dresses, I usually check out Topshop or Miss Selfridge and M&S never lets me down with feminine underwear - but with winter coats the research has to be done over and over again. It wasn't until my friend's wedding a couple of weeks ago that I got a crucial hint from my other friend who was at the wedding, too. 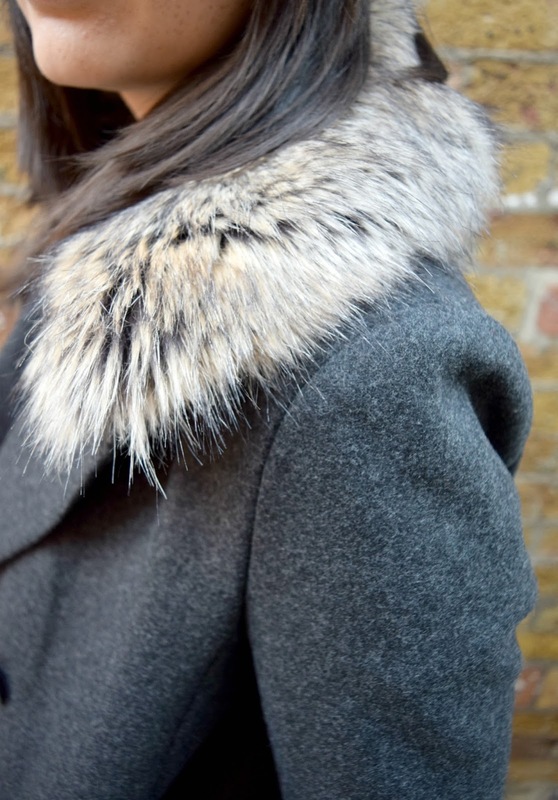 She had this beautiful grey long coat, nothing too fancy but a very classy tailoring and neat cut with a cosy faux fur. At first, my guess was Ted Baker but she revealed it was French Connection. So where did I go to during the Black Friday sale? Right, I checked out the winter coat sale at the Oxford Street FCUK branch and found this platform felt faux fur collar coat. It was reduced by 30% from its original £225 to £157. Still, a bit OMG-slightly-pricey but the incredible quality of the faux fur collar and its perfect fit convinced me to invest in the piece. Plus this ladies winter coat is a UK8 which means for the first time in a while I could buy a smaller size than to my usual UK10 and make me feel good about my shape (not like H&M where my standard UK10 is now a UK12 or UK14 shaking up my body confidence tremendously). The French Connection coats this season mostly feature simple yet chic designs. 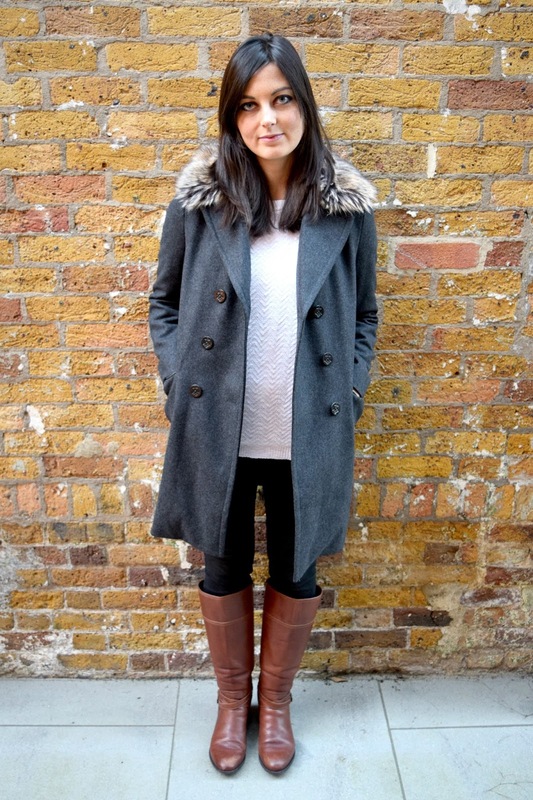 Mine is a wool-cashmere blend long coat with a changeable revere faux fur collar. The zip-fastened flap pockets are big enough to hold my Oyster card and phone. 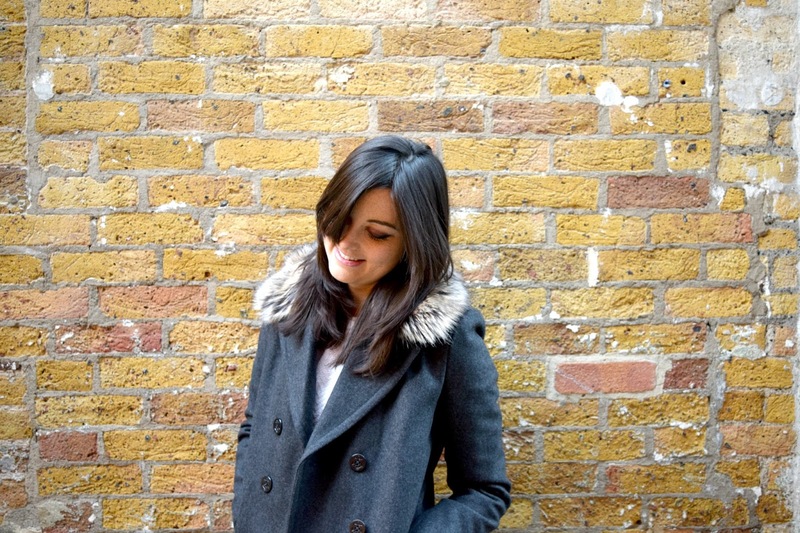 For today's look, I've teamed it up with a cosy, white jumper from Stradivarius and black Uniqlo jeans. My tan boots, which I have won a few weeks ago from Gemma over at Jacquard Flower, are from Lotus. These equestrian design inspired leather boots are perfect for Autumn and Winter looks, as the warm brown colour harmonises perfectly with the usual seasonal colours of white, black and grey. To me, a gorgeous pair of tan boots is an absolute wardrobe essential and shouldn't be missed in your collection. 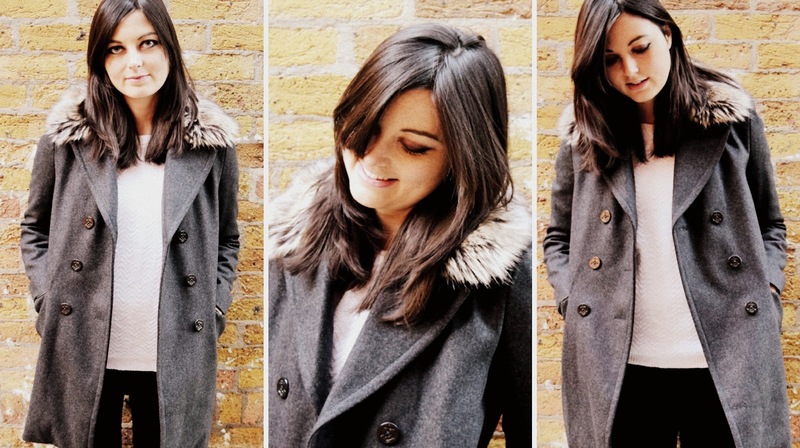 Thank you so much for checking out today's winter coat post and outfit of the day. Fingers crossed this one will last for more than one season.